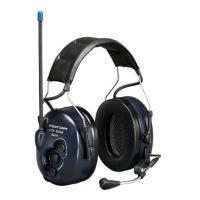 The Peltor Lite-Com Basic combines hearing protection with a built-in communication radio. Voice-controlled transmission keeps the wearers hands free for work while still maintaining radio contact. All communication radio functions are controlled by three simple buttons. The Lite-Com Basic communicates on the licence-free 446MHz frequency band, with 38 sub-channels per frequency. The sub channels also eliminate other radio traffic on the same frequency.